It is my day today to post a project for Top Dog Dies. My project today uses the new Top Dog Dies Banners #1. Such unique shapes that can be used in conjunction with other die sets or as stand alone dies as I did here today. Fun colors Tracey, I like the trio of banners all stacked up! Very original shape. Love it!! Great card too Tracey...love the colours! Was just playing with tht paper pad yesterday! 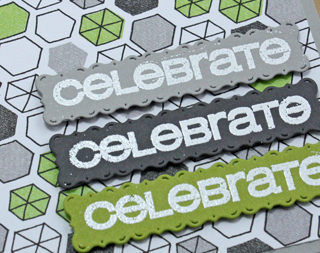 Love this combo of grey, lime, and white, Tracey - fun card! those dies are so cool.. love your card.. These banner dies are so fun and so is your card. I love that paper too, so fun! Fabulous design and colors. That banner is a great shape. Fabulous--such great colors and paper! And love the shape of the banner! Very cool! Love the great background and fun new tag set! Just fabulous! How is your hand?! I've been thinking of you lots. I'm sighing happily over yet another episode of "Tracey" magic with the Top Dog dies! The three sentiment banners, paired with that fabulous paper (another 'want') is utterly amazing! WOW!